The scene was pathetic. It appeared well choreographed. People had turned out in their numbers to vote. Suddenly, some thugs surfaced. They threatened voters to leave or get killed. Some concerned voters made some calls. Pronto, heavily armed policemen landed. They were in up to five vans. The thugs melted away. Concerned voters begged the police to stay. But they said there was no cause for alarm and left. Then, about 1pm, the worst happened. The thugs regrouped. They moved from one polling unit to the other, throwing bottles, pulling down canopies and burning ballot boxes. People ran helter-skelter. They looked for the security agents. But they were nowhere near the vicinity. Having achieved their aim of stopping the voting process, the hoodlums left. But one of them was unlucky. Angry mob caught him. They almost lynched him. But that was when the police surfaced and took him away. The mob set his motorcycle ablaze. In some other areas of Lagos such as Surulere and Ajao Estate, a similar scene was reported. These areas, especially Okota, are dominated by the Igbo. Perhaps, the fear of those who took this ungodly action was that the Igbo would vote for the Peoples Democratic Party (PDP). Last week, the national leader of the ruling All Progressives Congress (APC), Bola Ahmed Tinubu, had begged the Igbo to vote for the APC. According to him, the APC government in Lagos does not discriminate against the Igbo in the state; and Lagos is where the Igbo conduct their business. The questions are, why must we make this election an ethnic thing? Why identify some areas in Lagos and say you want to see how they will vote? And who really sponsored the thugs who disrupted the election? In some other parts of Nigeria, there were pockets of violence, killings, and snatching of ballot boxes. In Rivers, Anambra, and even Delta, some citizens paid with their lives. My heart bleeds for Nigeria. I thought we had done away with this type of violence during elections. I thought that by now, having attained 20 years of democracy, we would have mastered the art of free and fair elections. But the events of last Saturday have proved once again that we don’t learn from history. I remember in the Second Republic, politicians formed and armed thugs to fight their political battles. In old Anambra State, for instance, former governor Jim Nwobodo had the Jim Vanguard, while Ikemba Nnewi, Chukwuemeka Odumegwu-Ojukwu, had his Ikemba Front. These two groups were always fighting and seeking political supremacy over the other. Is this what Nigeria wants to return to? To disenfranchise one eligible voter from casting his vote is bad enough. To now disenfranchise thousands of people simply because of the fear of their voting for a candidate considered to be in a rival party is evil. And the Independent National Electoral Commission (INEC) must do everything possible to redress this anomaly. Good enough, INEC said it would conduct another election in some of the wards where violence held sway, especially in Lagos, Anambra and Rivers States. But we must be on guard. The Coalition of Political Parties (CUPP) had actually raised the alarm that the ruling party wanted to cause confusion that would engender staggered elections in some states. Like what happened in the Osun State governorship election last year, the rerun, it is feared, will be conducted in such a way that security agencies will be used to intimidate voters and swing victory to the ruling party. The behaviour of the security agencies in the Okota debacle tends to give credence to this fear. Or how do you explain the fact that they quickly appeared in the morning when the signal was first sent to them about the invasion of thugs and then disappeared when the real trouble started. They left only two unarmed policemen, for instance, at the Baba Ewe polling unit. And these men couldn’t do anything when the chips were down. As at press time, no clear winner has emerged from the presidential election. But irrespective of who wins, the process is seriously flawed. Never mind that there were upsets as early results have shown. For instance, the APC governorship candidate in Lagos State, Babajide Sanwo-Olu, reportedly lost in his polling unit. Similarly, former President Olusegun Obasanjo and even Atiku Abubakar reportedly lost in their units also. 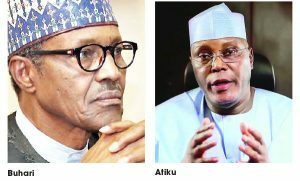 In the Aso Rock unit, President Muhammadu Buhari reportedly lost to Atiku. These notwithstanding, there is every need for Nigeria to seriously look into its electoral system. And I believe that the President of the country has the capacity to initiate that. We almost achieved that when Goodluck Jonathan was in power. He lost the 2015 election and surrendered peacefully to Buhari. Rather than improve on this, we started retrogressing again. The moment people realise that their votes won’t count, they will lose interest. And we will go back to the era of voter apathy. The international community must step in to help Nigeria. There is no sitting on the fence because what happens to Nigeria will have a spiral effect on the entire African continent. The United States intervened in Venezuela, where the incumbent President Nicolas Maduro manipulated the electoral system to return to power. The US and more than 50 other countries have recognised the opposition candidate, Juan Guaido, as the country’s rightful President. We must guard against the Venezuela experience. The only way we can do this is for INEC to identify the areas where election did not hold or where it was seriously flawed and conduct a fresh election. Security in those areas must be adequate and impartial. We can’t continue to give the impression that we can’t handle our affairs as a nation. The whole thing is sickening! Good day Casmir! I appreciate your article of last Monday and was happy that you admitted that it is not easy to conduct elections in Nigeria. My problem with the shift was why did INEC chairman wait till a few hours to the election before making it public? Could he claim that he didn’t know that they were having logistics problems much earlier than 2am Saturday when he made it public? The problem with most public office holders in Nigeria is that they tend to treat the masses with disdain and disregard. The postponement caused a lot of irreparable and irreversible losses to a lot of people and families. Dear Igbokwe, without mincing words, you goofed with your caption, having outlined some of the critical areas enmeshed with problem. Think of the killings in Kaduna, the burning of INEC offices in Anambra, Abia and Plateau states, the unsteady atmosphere in Zamfara, the threats to life in Rivers and so many issues raised, INEC chairman needs to be highly commended for at least saving those lives who could have died on election day, for a week. We all should know Nigeria as a nation is very complex with its people equally complex and hard to please. INEC chairman, I commend you, pray for you to succeed in this onerous task assigned to you, make name for yourself and family by being non-partisan and maintaining neutrality. – Pastor Livy Onyenegecha, Ibeku Okwuato, Mbaise, Imo state, [email protected] . Bros, good day, please use your medium to inform APC chairman who is accusing PDP that INEC is colluding with them to postpone election to desist. Inform him that time will catch up with him. Thumb-printed ballot papers in some states in favour of APC, who does that? Kogi governor seen thumb printing, how far? These are the factors that forced INEC to shift it, not PDP. Let it be in December, APC has gone forever.